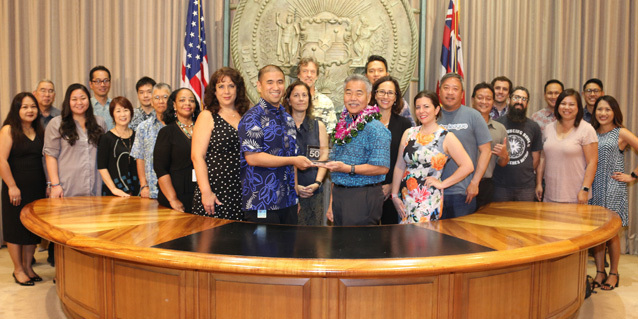 HONOLULU — The Hawaii Annual Code Challenge (HACC) has been awarded the State IT Innovation of the Year award by StateScoop, the leading government IT media company in the nation’s capital. HACC was selected among 49 finalists from across the country for the top award. The StateScoop 50 Awards annually honor the best and the brightest who make state and local government more efficient and effective. These awards celebrate the outstanding achievements and acknowledge the tireless effort to make a positive impact in the government IT community and in public service. Conceived by Gov. David Ige, the HACC is coordinated by the Office of Enterprise Technology Services (ETS) in partnership with the Hawaii Technology Development Corporation, several non-profit organizations, and multiple state departments and agencies that put forth challenges to community participants for identifying innovative ways to improve government services. The HACC breaks the mold of a traditional hackathon, which typically takes place over a single day or weekend. The HACC provides an expanded month-long timeframe intended to encourage interaction between community teams and state personnel throughout ideation and development, ultimately resulting in implementable solutions. With participation exceeding its inaugural year in 2016, last year’s event was successful in engaging the tech community in government modernization and exposing individuals to state IT careers. This year’s HACC is planned for this fall.